I’ve enjoyed hammocks all over Central America. It’s a way of life in this region, standard home furnishing, and a pastime enjoyed by all. Truck drivers stuck at customs checkpoints string them under their tractor-trailers. Families on front porches take quick naps—nothing puts a baby (or anyone for that matter) to sleep faster than a gently swinging hammock. And there’s nothing better than a cold drink on the beach, hanging between two palms, enjoying the shade and sea breezes. Professional hammock tips: thoroughly check the trees you’re using to hang your hammock for ants. I found this out firsthand at a remote beach where my nap was rudely interrupted by nibbling ants. Also, there is no graceful way to quickly get out of a hammock. And the most comfortable way to relax in a hammock is not to lie straight down with arms parallel to the sides. Instead you want to be at angle—trust me on this. The best hammock I’ve found myself in recently was at a cabin on a hillside over Drake Bay, on Costa Rica’s far southern Pacific coast. I drifted into satisfied slumber to the sound of crashing waves and insect chirps and bird calls of the rain forest just as the golden light of late afternoon gave the surrounding trees and the glittering Pacific below a subtle glow. 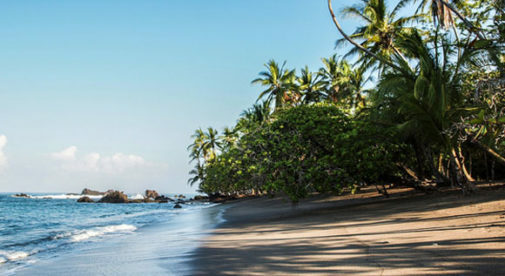 Drake Bay (named for Sir Francis Drake, who anchored here in the late 16th century and is said to have left buried treasure) is on the Osa Peninsula, a place where Costa Rica is still wild and unspoiled, probably not that much different than when the English privateer visited all those centuries ago. There is a town. But it’s a small place. Seafood restaurants—fresh-caught red snapper at $9 a plate—line the road coming off the beach, a few stores offer the essentials…after dark it’s super-quiet. But you don’t come for the nightlife, you come for the nature. It’s one of the most beautiful spots I’ve been on the planet. And I probably would never have seen it if I wasn’t an expat. Living in Costa Rica has provided me a real life of adventure. And you can find it just about everywhere you go. I’ve stared down into the depths of a volcano in the Central Valley, watching the shifting colors of a vivid blue and green smoking sulfurous pool. I’ve braved the rush-hour traffic and maze-like streets of San Jose, the capital, to attend the country’s first ever craft-beer festival (worth it, they’re doing good work down here and—lest you be ready to chastise me—I even had a designated driver for the way home). I’ve tasted tropical fruits I’d never ever seen before at boisterous ferias (farmers’ market)—try the caimito, zapote, and mamon chino if you ever have the chance. And had lengthy and spirited discussions about futbol and the chances of the Costa Rican national team in the World Cup with more taxi drivers than I can count. Those are just some of the weird, wonderful, frustrating, and funky experiences you can have as an expat. It’s all about making the act of stepping outside your comfort zone part of your everyday life. Embracing your new country’s culture. It’s a lot of fun. And, of course, you always have your hammock to relax in at the end of the day.